FAISALABAD: A man and a woman were burned to death when a fire erupted here on Thursday in the Sitara Market in Factory Area. Reports said the fire broke out in the cloth market, reducing 15 shops to ashes within half an hour. 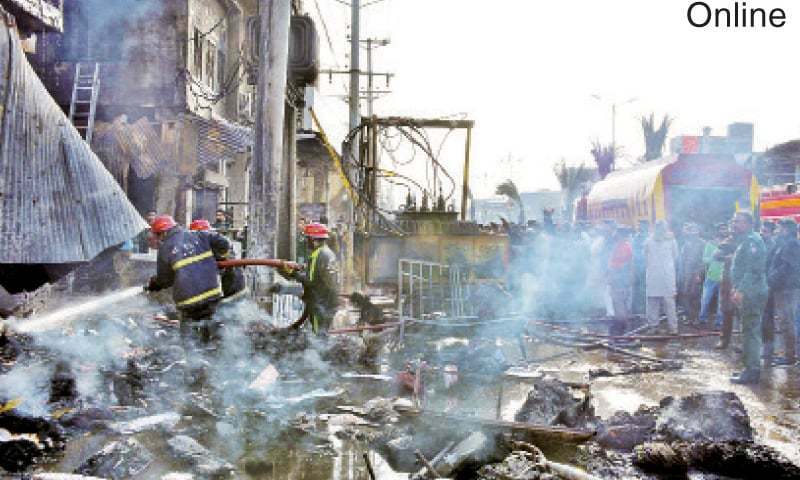 The blaze engulfed two electricity transformers and some motorcycles parked outside the market and other belongings of the shopkeepers like wooden benches and fabric material. Some people sustained burn injuries while trying to save their belongings. Rescue 1122 with the help of nine fire tenders put out the flames in three hours. The blaze inflicted colossal loss on the traders. Talking to reporters, some traders said they were at their shops and dealing with customers when they heard about the fire. The cause of fire is yet to be ascertained. Some eyewitnesses said they saw some flames on the electricity transformer which spread to the wire leading to fire inside the market. Rescue 1122 spokesperson Faisal Zia said two bodies were recovered from the spot.